Already today, I have seen one comment that the Massachusetts tornado was "unpredictable." While this has been a horrible tornado season (worst in more than a half century), the tornadoes have been extremely well predicted. That said, I have also received a number of questions about how the long-track Massachusetts tornado was forecast and tracked and I'm happy to answer them. 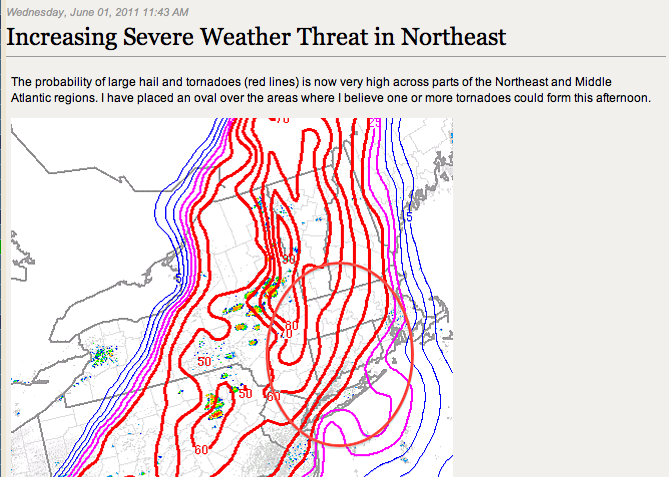 The graphic below was posted on this blog the evening before the tornado. 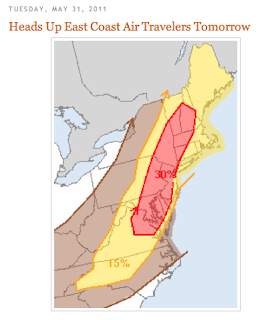 Western Massachusetts is in the 30% relative probability area for tornadoes and severe thunderstorms which is a high number for the day before an event. 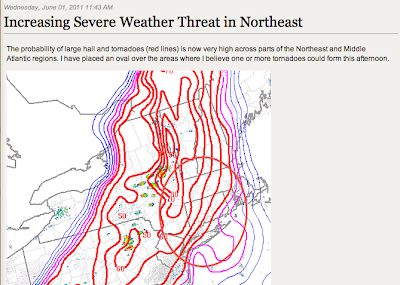 The graphic below was posted on my AccuWeather Pro blog (where I go into the deeper meteorology than I do in this public blog) about three hours before the tornado formed. I call the probability of tornadoes "very high." The oval was where I was forecasting the high tornado risk. A tornado watch was issued for the public about twenty minutes later. The tornado's formation, from a "supercell" thunderstorm, evolved as it would in a Kansas tornado. 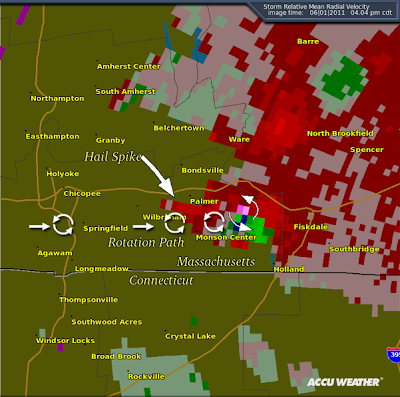 Here is the radar at the touchdown point of West Springfield complete with "debris ball" (circled) which is a signature of a tornado on the ground. The radar's Doppler wind display was very helpful throughout the afternoon showing the tremendous value the public has received from the National Weather Service's investment in Doppler radar in the 1990's. the very large hail that fell with this storm. The last well-defined debris ball was east of Fiskdale at 5:18pm EDT. 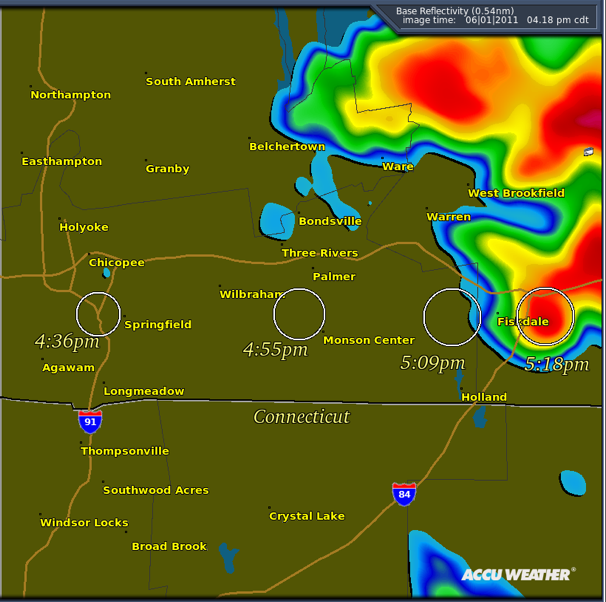 AccuWeather's SkyGuard® meteorologists were tracking the tornado and informing clients throughout the afternoon. 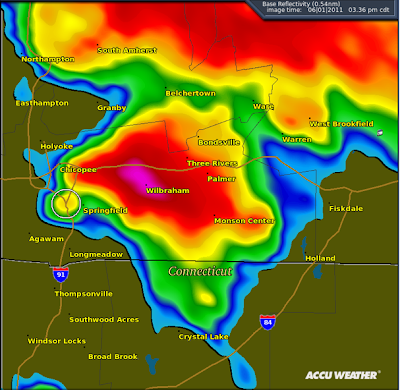 The National Weather Service issued warnings for the public, a number of which were the topic of special reports at AccuWeather.com and on this blog. In June, 1953, before a tornado warning program existed in the U.S., a tornado struck Worcester, MA killing 94. It is likely that yesterday's forecasts and warnings kept the death toll (tragically, four) lower than it otherwise would have been. Have the tornadoes truly been worse, or have the big ones just happened to hit more populated areas, rather than some wheat fields (in which case there wouldn't be enough structural damage for a proper EF assessment)? Monster, hard to know the answer to your question. Prior to this year I have been frequently asked, "why don't tornadoes hit cities." I explain they are relatively small targets so, statistically, densely populated cities will be hit infrequently. This year, the statistics seem to have caught up with us. Another item that makes comparison difficult is that we have detailed surveys of some of these events which we certainly did not have in, say, 1953. That said, this does appear to be the worst since the '50s. Thank you for this update. Do you think that the effects of this tornado will last for long? What is the expected weather for the coming few days; will travel to Boston be safe in about three days' time? "Another item that makes comparison difficult is that we have detailed surveys"
That and the Doppler radar that lets you get an excellent estimate of the wind speeds on twisters in the middle of nowhere, and can compile statistics on strong storms that don't cause any structural damage simply because thy didn't hit any structures. This is analogous to the increase in the number of named tropical storms because we have on satellite storms that never come close to land. Decades ago, no one knew those storms existed unless by chance a ship radioed one in, so they never got names.
" Doppler radar that lets you get an excellent estimate of the wind speeds on twisters in the middle of nowhere,"
Doppler allows us to find tornadoes but it does not measure the wind speeds within the tornado because the radar "cross section" is too large to see the areas of extreme winds in a tornado.